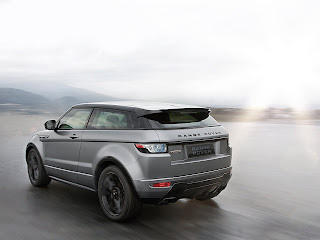 The Range Rover Evoque is a compact crossover utility vehicle (CUV) produced by the British manufacturer Land Rover, part of Tata's Jaguar Land Rover group. 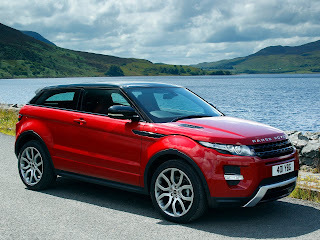 The Evoque has been produced since July 2011 in three- and five-door versions, with both two-wheel and four-wheel drive. The Evoque is designed to appeal to urban buyers and meet requirements for lower CO2 emissions and fuel economy. The production vehicle is similar to the Land Rover LRX concept, which was unveiled at the North American International Auto Show in January 2008. The Evoque has been received positively by the automotive press for retaining the features, amenities, and off-road capabilities of a traditional Range Rover in a smaller package. Land Rover sold nearly 88,000 units of the Evoque in its first year of production. The Evoque was developed from the LRX concept vehicle with the goal of producing a smaller more environmentally conscious vehicle. The size of the LRX complemented a wide array of efficiency improving technologies in the form of Land Rover’s e_Terrain technologies. These included biofuel compatibility, lightweight construction materials and technologies such as the removable carbon composite roof panels, regenerative brakes, a stop-start system, and the ERAD (electric rear axle drive) parallel hybrid powertrain system. The ERAD system could propel the LRX to speeds of up to 20 mph (32 km/h) before the engine was started by an integrated starter generator as part of the stop-start system. ERAD was designed to reduce CO2emissions by an average of 20 percent under the NEDC test cycle and was expected to offer another 10 percent reduction in extra-urban driving situations while also optimising the off-road ability of the vehicle. Land Rover aimed to achieve 120 g/km CO2emissions and fuel economy of 60 mpg-imp (4.7 L/100 km; 50 mpg-US) on the European combined cycle with an efficient 2.2-litre turbodiesel engine. The engine would become the only four-cylinder vehicle in the Range Rover lineup. The latest incarnation of Land Rover’s acclaimed Terrain Response system was also included offering sport and eco modes in addition to the existinggrass, gravel, snow, and sand modes. Typical Land Rover design traits aim at improving off-road performance included a prominent driving position, hill descent control, and useful approach and departure angles. A Land Rover first was an air intake system integrated into the roof which offered exceptional wading capabilities though this feature did not make it to the production model. Land Rover's Range Rover styling was visually apparent in the form of the clamshell bonnet, the ‘floating’ roof, dual-pocket headlamps, and raked roof line. 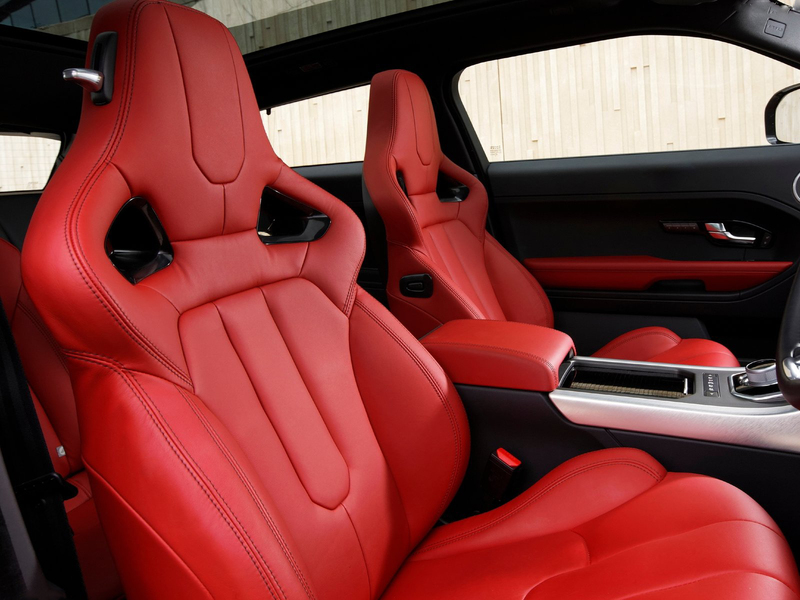 Interior design improvements were another main focus of the LRX concept though the interior of the production Evoque changed significantly from the concept LRX. 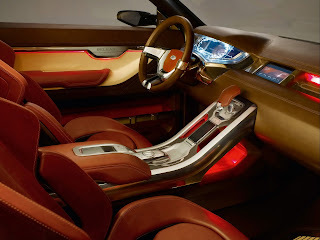 Notable interior features in the LRX included ambient interior lighting that changed according to Terrain Response settings, and vehicle data which was presented to the driver through a ‘floating’ three-dimensional LCD display. An aluminium centre console with an iPhone docking station stretched the length of the cabin, separating the four seats and the tailgate. Seats with open frameworks were used to give the impression of an airy interior while also creating useful under-seat and under-floor stowage areas. Electric motors folded the rear seats forward providing enough room for two mountain bikes to be fitted upright, with front wheels removed and stored in dedicated slots in the floor. Production of the Evoque started on 4 July 2011, at Halewood, with the first customer deliveries in September. The British Motor Industry Heritage Trust was given the first vehicle off the line to add to their collection, held at the Heritage Motor Centre in Gaydon. 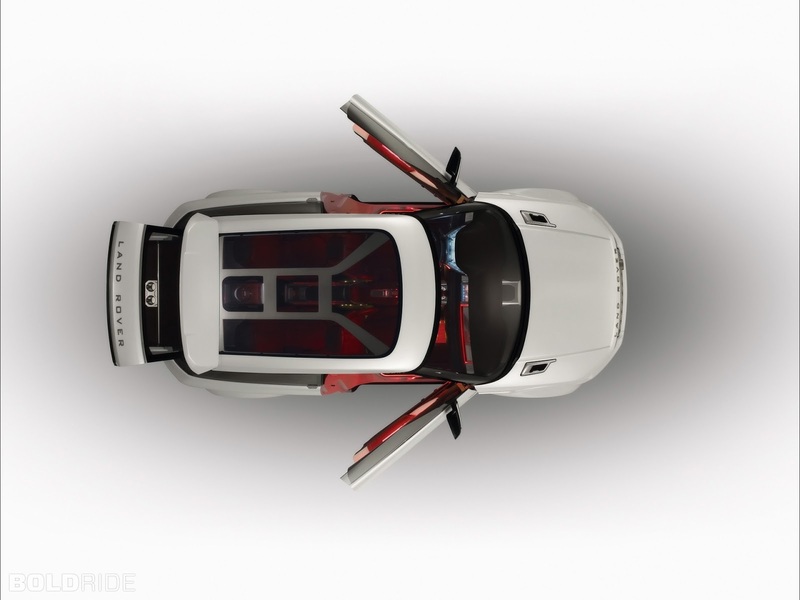 The production model Evoque retained nearly identical bodywork from the LRX prototype including the cabin length the panoramic sun roof. 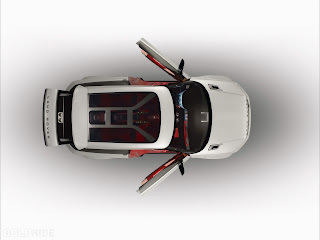 However no hybrid power train is being offered, due to the new top-down hybridisation project undertaken by Land Rover, which will first feature the heavier vehicles such as the Land Rover Discovery, and regular Range Rover, and then later move on to lighter vehicles such as the Evoque. Though, a version of the terrain response system is included. The Evoque departs from the classic body on frame design used in the 20th century for vehicles designed for off road use. Instead the Evoque features a more modern unibody construction technique for improved handling and ride quality, and to appeal to buyers who drive primarily on road. Despite a lack of traditional body on frame construction and dedicated transfer case, the Evoque is still capable of class leading off road performance with 215 mm (8.5 in) of ground clearance, 25 degree approach and 33 degree departure angles, and the ability to ford up to 500 mm (19.7 in) of water. The Evoque platform, named LR-MS, is loosely based on the Ford EUCD platform (which was used on the company's Freelander 2) but 90% of its parts were redesigned. The manufacturer's fuel economy estimates for the 2.2-litre diesel engine with manual transmission are 47.1 miles per imperial gallon (6.00 L/100 km; 39.2 mpg-US) urban and 56.5 miles per imperial gallon (5.00 L/100 km; 47.0 mpg-US) combined, with CO2 emissions of 133 g/km. For the 2.0-litre petrol engine with automatic transmission the figures are 23.7 miles per imperial gallon (11.9 L/100 km; 19.7 mpg-US) urban and 32.5 miles per imperial gallon (8.69 L/100 km; 27.1 mpg-US) combined, with 199 g/km CO2. United States Environmental Protection Agency fuel economy estimates have been stated as being 19 miles per US gallon (12 L/100 km; 23 mpg-imp) in the city and 28 miles per US gallon (8.4 L/100 km; 34 mpg-imp) on highways for the 2-litre petrol version. 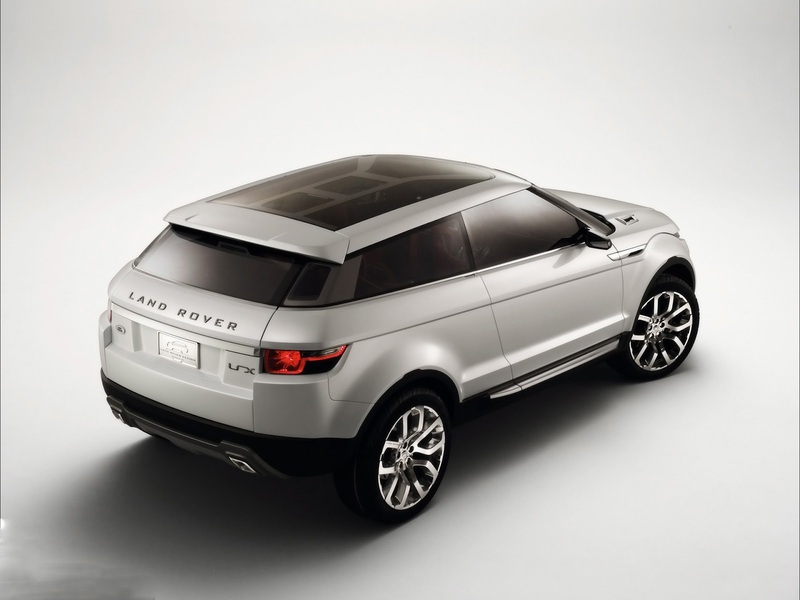 The car was launched as two distinct models: the five-door Evoque and the three-door Evoque Coupé. The five-door model is available in three trim levels — "Pure", "Prestige" and "Dynamic". While the "Evoque Coupè" is only available in two trim levels — "Pure" and "Dynamic". Land Rover markets the Pure as the minimalist version rather than the "base model" while the Prestige adds luxury options and the Dynamic focuses more on performance. Land Rover estimates 80% of North American sales will be for the five-door model. The cabin is intended to be upscale and luxurious in line with the rest of the Range Rover brand. 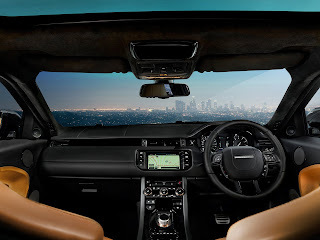 More notable options are a cabin length fixed sunroofand a 8–inch touch screen entertainment system that can display two different images simultaneously to both the driver and front passenger, the same system used in other Range Rover and Land Rover models. 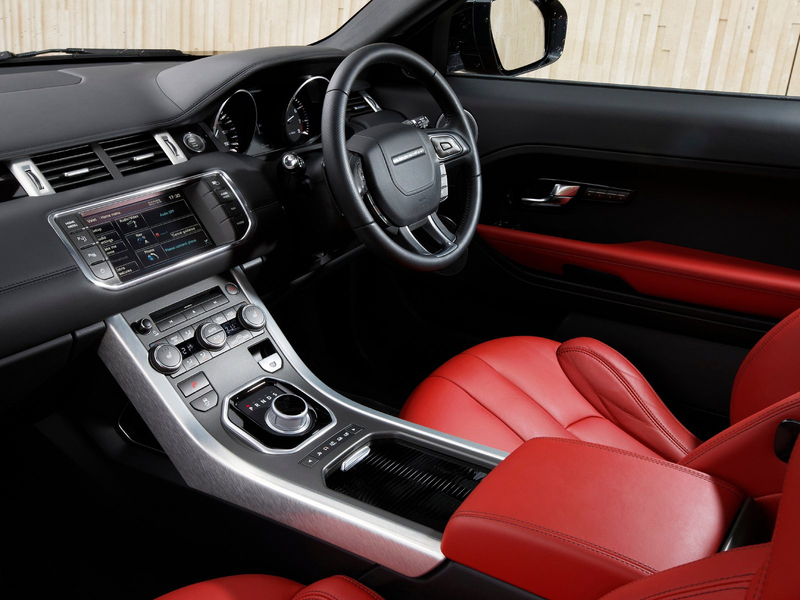 As well as mood lighting, in colours such as red, and blue, located in the door sills, handles, and other nooks and crannies of the Evoque. The Evoque also has a push button start system, which will start the vehicle automatically, once the key fob is sensed. The cabin seats four, with optional heated seating, steering wheel, and windscreen wipers. There is also a 5–inch driver's information display, which displays information about the vehicle, and more. There are 12 interior colour choices available in a variety of wood and metal trims as well as three optional contrasting roof treatments. Engineers used advanced weight saving techniques to bring the total kerb weight down to under 1,670 kg (3,700 lb). The use of aluminium for the bonnetand the roof, and composite plastics for the one-piece tailgate helped produce a vehicle weighing 100 kg (220 lb) less than the Freelander. The Evoque can be equipped with five exterior cameras to give the driver added visibility for off road maneuvers and compensate for the sloping roofline design with limited rear visibility. The Evoque comes in twelve different body colours with three optional contrasting roof colours and five optional wheel choices though Land Rover offers a "designers choice" of predetermined combinations on most models. The Dynamic model incorporates more aggressive bodywork including a different front fascia and lowered suspension. Three engine options are available for the Evoque: two 2.2-litre turbodiesels producing either 148 bhp (110 kW; 150 PS), or 187 bhp (139 kW; 190 PS), and a 2-litre 237 bhp (177 kW; 240 PS) turbocharged petrol engine. The 2.0-litre turbo charged engine is sourced from the Ford Ecoboost also being used in the Ford Edge, Ford Explorer, and Volvo S60. Small displacement high output engine choices were made to provide the Evoque adequate power while meeting increasing fuel economy requirements. Despite half the cylinders and less than half the displacement of the Range Rover Sport, the 2.0-litre turbo Evoque with a six-speed automatic transmission achieves similar performance figures including a 6.7 second 0 to 60 mph (0 to 97 km/h) time and a higher 0.82 g average lateral acceleration. 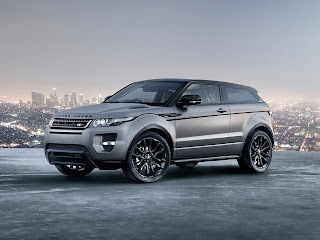 Land Rover revealed the Evoque with nine-speed automatic transmission during the Geneva Motor Show. This new automatic transmission is developed by ZF Friedrichshafen and offers better acceleration, efficiency and improved comfort. In addition, the nine-speed automatic transmission's first gear is specially designed for off road conditions, towing and adverse on road conditions. And also, first gear of a nine-speed automatic transmission is much lower than the first gear of a six-speed automatic. 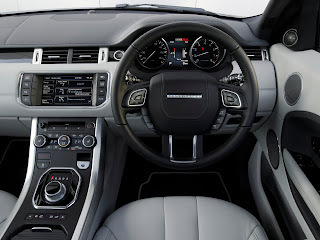 However, Land Rover did not reveal any further technical details about the new automatic transmission. The Australasian New Car Assessment Program (ANCAP) rated the Evoque four out of five stars for crash safety, scoring 32.49 out of 37. This score takes into account the 12.39 out of 16 rating in the frontal offset crash test, and the score of 16 out of 16 received for the side impact test. 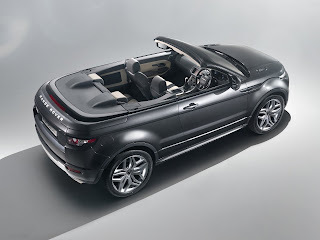 At the 2012 Geneva Motor Show, Land Rover unveiled an Evoque Convertible Concept, calling it "The world’s first premium SUV convertible", in comparison to the mid-level Nissan Murano convertible launched in 2010. The vehicle is based on the three-door Evoque Coupè but with seats for four, and has a power-retractable soft top roof. The concept sits on 21-inch wheels. 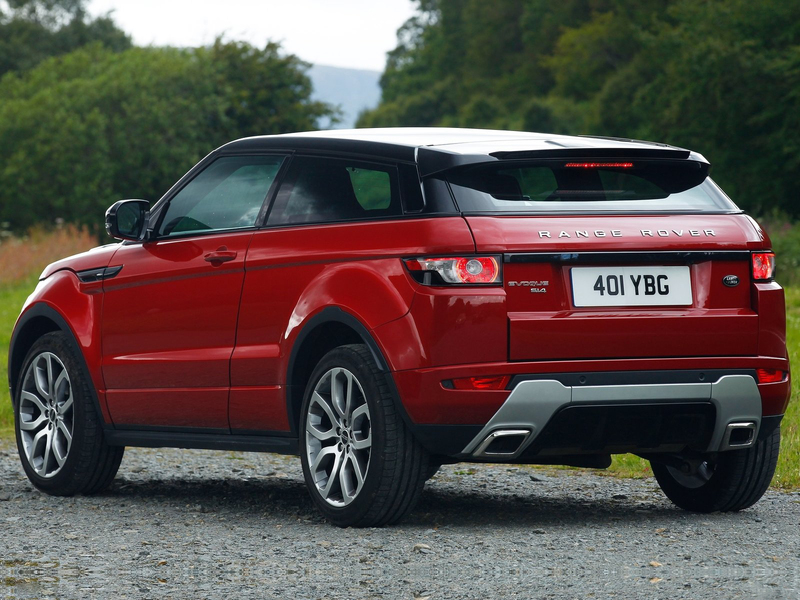 The Evoque's hatchback has been replaced with a drop-down tailgate. 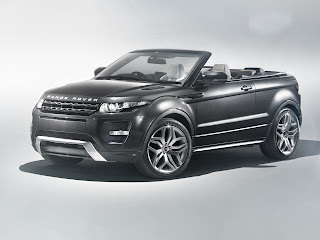 Land Rover has stated that: "The new convertible body has been achieved with minimum changes to weight and torsional rigidity. 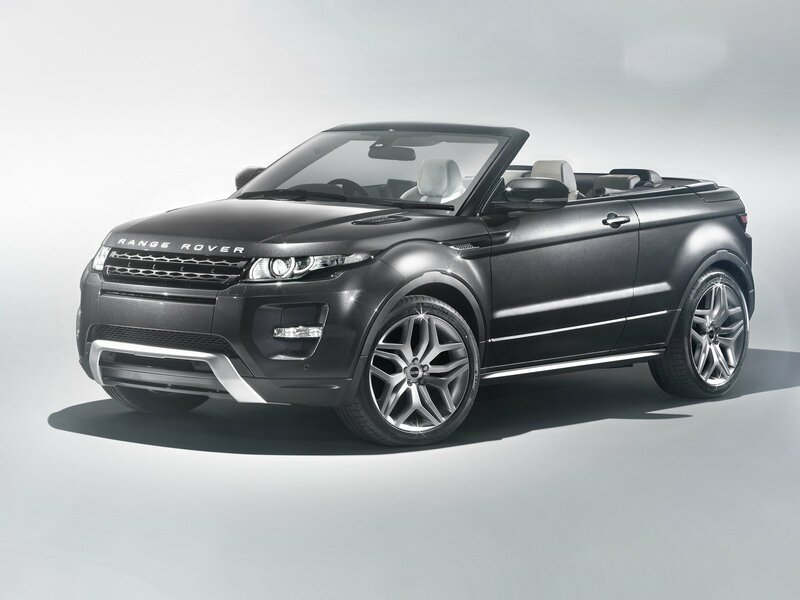 Land Rover has also stated that the Convertible Concept is as off-road ready as the regular Evoque. 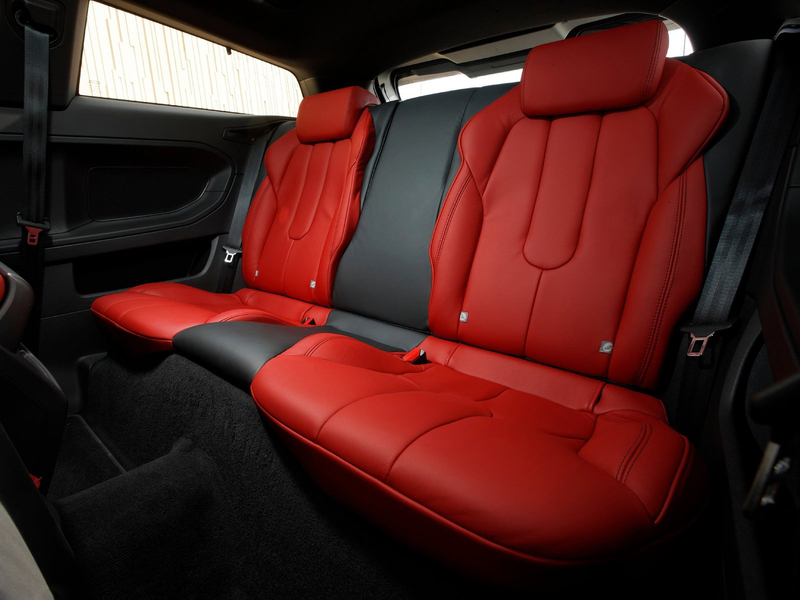 Victoria Beckham was involved with the Evoque Special Edition, jointly designed by her and Land Rover's Gerry McGovern. The special edition was announced in April 2012 at the Beijing Motor Show. 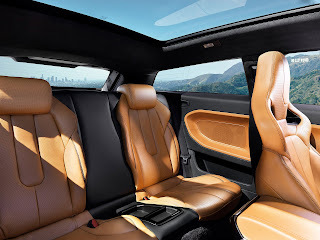 The special edition is based on the three-door coupe, featuring rose gold accents, which McGovern stated was inspired by Beckham's rose gold men's watch she wore upon first entering the design studio, vintage tan leather seating and matt grey exterior paint. The black wheels, grill, and other accents, all have rose gold accents. There is also a limited edition his and hers luggage set, a purse and a wallet, all designed by Beckham. The Evoque is equipped with either a generation IV Haldex permanent Four-wheel drive system, or two-wheel drive. The Evoque also comes standard with Land Rover's latest version of Terrain Response, which maximises traction in a variety of conditions by altering throttle response, power distribution, and suspension settings. The Terrain Response system also includes electronic stability control, roll stability control, traction control, and an optional hill descent control which automatically applies braking to control speed when moving down an incline. A third generation MagneRide suspension system is also available which works by magnetising iron particles inside the suspension fluid to quickly adapt shock absorber firmness to road changes. Prior to going on sale in September 2011, Land Rover had 18,000 pre-orders for the Evoque. By July 2012, a year after production began, the company had sold 80,000 units. And soon after, Land Rover revealed that they had sold nearly 90,000 units. Since its launch the Evoque has received acclaim from the automotive press including several "best of" awards. The popular British car show Top Gear, view the Evoque as the softening of the Land Rover image, though Top Gear were impressed with the Evoque's off road capabilities. Motor Trend contends that the Evoque is the necessary evolution of the Land Rover brand to stay competitive in a more environmentally conscious marketplace. 2011 Car of the Year by Top Gear, "SUV of the Year 2011" and "Jeremy's Car of the Year". Criticism has been made of the Evoque's voice interface and the entertainment system's touchscreen. Land Rover have marketed the Evoque as being more hip, fashionable, and urban-oriented, than their other models. In addition to this, much of the marketing for the Evoque is directed towards urban-consumers. In 2011, Land Rover brought the Evoque to New York City for promotional purposes. They drove numerous models around the city, most notably in Times Square, where a set oftelevision commercials was filmed for the North American market. Land Rover even set many of the Evoques in the center of Times Square for weeks, which attracted much public, and media attention. This helped get the word out for the Evoque. Land Rover has also made many print, online, and radio ads for the Evoque, as well as doing similar publicity stunts in cities such as Shanghai, Dublin, Los Angeles, London, and Paris. 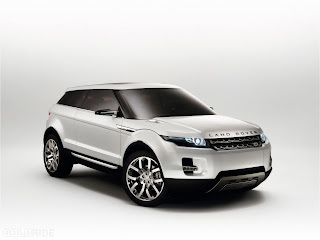 Land Rover has also released a number of apps, for the Apple iOS AppStore pertaining to the Evoque. For example, one is called "Land Rover Range Rover Evoque iConfigurator", which can help buyers customise their own Evoque. Another is an interactive brochure for the Evoque, with which one can learn information, and details about the Evoque, and its variations. Last updated on 26 July 2013 at 11:11.